We Get Requests is a perfect example of Oscar Peterson's remarkable two-sided appeal. Technically, the album is filled with above average melodic development and solid rhythmic blend, while the repertoire is a crowd-pleaser. On this LP, the listener is treated to a tasteful mixing of current pop tunes, standards and originals. 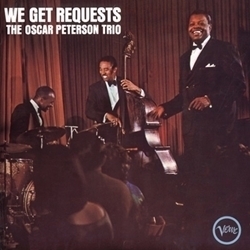 In We Get Requests, the Oscar Peterson Trio shows again why it is consistently at the top of polls taken among fans and musicians alike. Oscar, Ray and Ed had that rare ability to please the public with music of the highest quality. We Get Requests is a perfect example of Oscar Peterson's remarkable two-sided appeal. Technically, the album is filled with above average melodic development and solid rhythmic blend, while the repertoire is a crowd-pleaser. The listener is treated to a tasteful mixing of current pop tunes, standards and originals here while the Oscar Peterson Trio shows again why they're one of the best in the business. So imagine that. We Get Requests, of course, is a timeless audiophile classic. This 1964 studio session features the Peterson trio with bassist Ray Brown and Ed Thigpen, a group that had been together for five years by then and performed like a well-oiled machine. The repertoire is mostly pop songs of the day, including bossa nova tunes and film themes, and the treatments are fairly brief, with emphasis placed squarely on the melodies. Even in their lightest moments, though, the group demonstrates some of the qualities that made it among the most influential piano trios in jazz, a group that could generate tremendous rhythmic energy and a sense of developing musical detail. For all his legendary force, Peterson possesses a subtle rhythmic sense, and here he infuses even "People" with an undercurrent of swing. 5. Have You Met Miss Jones?